Late that I almost always am in watching the 'big name' movies, maybe everything that I thought or felt after watching Bahubali has already been said, contradicted, analysed, deconstructed, etc. But still I feel like sharing a few thoughts that came to me, as and after I watched this mega-film Bahubali. 1. What is most impressive about the film is its grandeur, both of the backdrop as well as of the plot itself. While there is much said about the excellent special effects and the wondrous epic-scale narrative of the film, what I found most appealing in the film was the essential grandness of the symbolism behind the big themes in the film's plot and narrative. That's what make the film what it is, I think. 2. In today's age of commercialism, a film like any other cultural product meant to make money for its producers, is definitely going to use all the tricks that would help make the product more marketable and profitable. But using that against the film is like denying the existence of the gross physical-vital-commerical-consumerist nature of the times we live in. So there's hardly any point in going any further down this flimsy route of criticism. 3. But there is something else. All those who get caught up in the sub-text of one little scene here or there miss out on appreciating the real impact the film is meant to make. 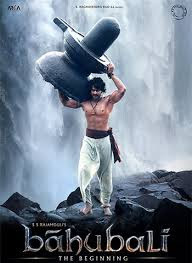 All those who like to view and critique everything, including a period drama, using the presently-popular moralistic and politically-correct view of things totally miss out on the eternal essential truths that a film such as Bahubali is trying to represent. 4. The film, being a period drama, represents rather well a certain social-cultural-political-moral-ethical framework which has to be accepted as one piece in the long evolutionary march of human civilization as well as Indian civilization. It is rather silly, if not outrightly flawed, to apply either a modern feminist view (straight-jacketed though it may be) or a modern democratic view of outer individualistic equality (narrowly rigid though it may be) to critique a story -- and the actions or choices or beliefs of its characters -- based in a time much different from today. This not only shows a complete disregard for the evolutionary and upward-spiraling nature of civilizational march, it also shows an utter neglect of the deeper human quest for the timeless in the time-bound and for the universal in the context-bound nature of a good story. That's what all good stories are all about, ultimately -- having the richness both of a context- and time-bound specificity as well as a universal and timeless essentiality. Bahubali is a story like that. 5. What also makes the film a real winner is its ennobling and uplifting quality, which comes through the nobility of its leading characters and the symbolic nature of the events which move them. 6. Looking at these characters and the contexts in which they move only from the outside -- e.g. larger than life, heroic, wars, violence, revenge etc. -- misses the real point, I think. It is what these characters and circumstances typify and represent as the big themes in the ever-evolving yet essential Indian cultural psyche that need to be appreciated if one really wants to get to the essence of the film. 7. Whether it is the kshatriya virtue of power that is grounded in the ideal of dharma or the ideal dharma of a king to both suppress the enemy and protect the weak, whether it is the working out in the outer life and nature of the principle of Satyam Shivam Sundaram (Truth, Divinity, Beauty) or the perennial struggle between the forces of Truth and forces of Falsehood, whether it is the interplay in life of Prakriti and Purusha, Destiny and Free Will, or the essential oneness and interdependence of man and woman -- equal yet different, all such themes and ideas are beautifully depicted through the leading characters, their aspirations, their works, their choices as well as the contexts in which they work out their lives, choices, actions and feelings. ...Intrinsically, in its most fundamental sense, Arya means an effort or an uprising and overcoming. The Aryan is he who strives and overcomes all outside him and within him that stands opposed to the human advance. Self-conquest is the first law of his nature. He overcomes earth and the body and does not consent like ordinary men to their dullness, inertia, dead routine and tamasic limitations. He overcomes life and its energies and refuses to be dominated by their hungers and cravings or enslaved by their rajasic passions. He overcomes the mind and its habits, he does not live in a shell of ignorance, inherited prejudices, customary ideas, pleasant opinions, but knows how to seek and choose, to be large and flexible in intelligence even as he is firm and strong in his will. For in everything he seeks truth, in everything right, in everything height and freedom. Self-perfection is the aim of his self-conquest. Therefore, what he conquers he does not destroy, but ennobles and fulfils. After all this, I am sure you can tell I am looking forward to the film's sequel next year.